Many people see Alaska as an icy world where only the foolhardy would venture. In part, they are right. Alaska has over 30 distinct glaciers. The state also has more than 100 hot springs and fumaroles, or steam vents. Prior to statehood in 1959, the territory was nicknamed "Seward's folly" or "Seward's icebox", a supposed gaffe by then-U.S. Secretary of State William Seward. In 1869 he negotiated the purchase from Russia of over 300 million acres, about 600,000 square miles, for the princely sum of two cents an acre. The financial rewards and aesthetic beauty from that transaction are incalculable. Included among the natural resources in the purchase were the Yukon River, a vital part of the Alaskan Gold Rush of the late 1800s; the Kenai River, now famous for its red salmon runs and trophy trout; Iliamna Lake, Alaska's largest; Lake Louise, the largest with road access and now one of the state's biggest tourist draws. In addition, Denali (Mount McKinley) at over 20,000 feet, is America's tallest and anchors the rugged Alaska Range. Among the 1800 named islands, the largest and most well-known is Kodiak Island. Over 200 islands make up the Aleutian chain in the southwest corner of the state. 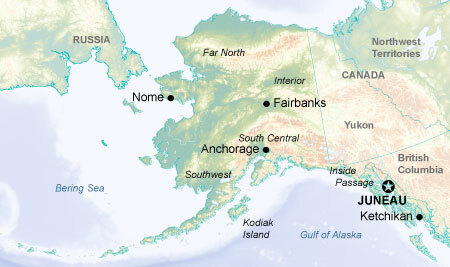 Alaska has more than 30 national parks, preserves and monuments. Among these are Glacier Bay National Park and Preserve and Sitka National Historical Park. They provide a venue for the outstanding big game hunting of moose, bear and Dall sheep. Those sportsmen who prefer can try their luck in the Gulf of Alaska or the Pacific Ocean for the vaunted king salmon, king crab or giant halibut. There's more for the outdoor enthusiast. Try your hand at jade mining or stand in awe of the Aurora Borealis. The Northern Lights can be seen year round but peak viewing times are in March and April as well as in September and October. The world-famous Iditarod, a dog sled race from Anchorage to Nome, occurs in March. The state's motto, "North to the Future," is also a state of mind. Although wild and beautiful and sparsely populated, the state has about 15 colleges, many in Anchorage, for those seeking to enhance their education.